The large 77mm version affords an insurance approved CEN Grade 5 whilst the 63mm reaches CEN 4. 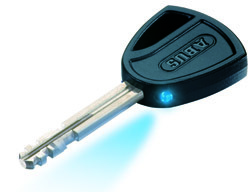 Both use an ABUS Plus cylinder which boasts 250,000 key different variations and keys that cannot be copied at a traditional locksmith without your unique 'code-card'. This padlock comes with the added benefit that the shackle can be removed from the body entirely. Out of the box the shackle is like any other padlock and retained inside the lock when in the open position. However, if you follow our tutorial you'll be able to convert the lock so that the shackle releases completely, allowing more room to maneuver the lock in tight spaces. Click here for shackle release tutorial. All our padlocks are delivered with 2 keys each inclusive of the price including 1 LED power version. 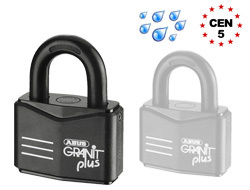 However, if you require additional keys you do need to purchase the keyed alike version of this padlock and then order the additional keys from that page. Please visit the Keyed Alike Section. We have two sizes in this model. 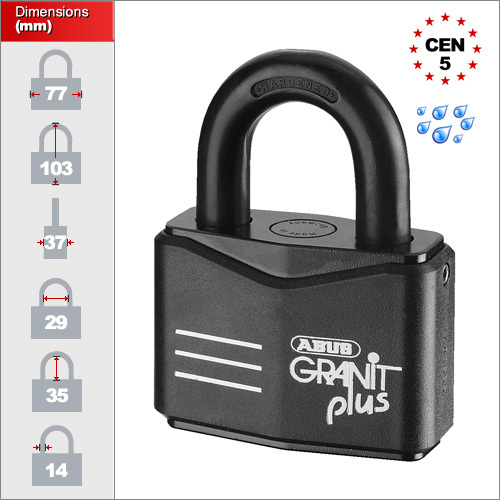 The 63mm which gets an insurance CEN Grade of 4 and the 77mm which reaches a huge CEN Grade 5 which is exceptional for an open shackle lock. 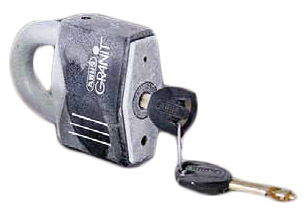 This lock is also high resistant to cold temperatures. Although it is not 100% capable of withstanding ice, it will be much more reliable than a normal pin-tumbler padlock. Here are some good images showing freeze testing and also the breakdown of the cylinder. What is noticable is the lack of springs and moving parts. the mechanism is simple made from rotating disks, making it impossible to pick and highly resistant against weather and freezing.